Oh Happy Day!! No, really, It Is!! 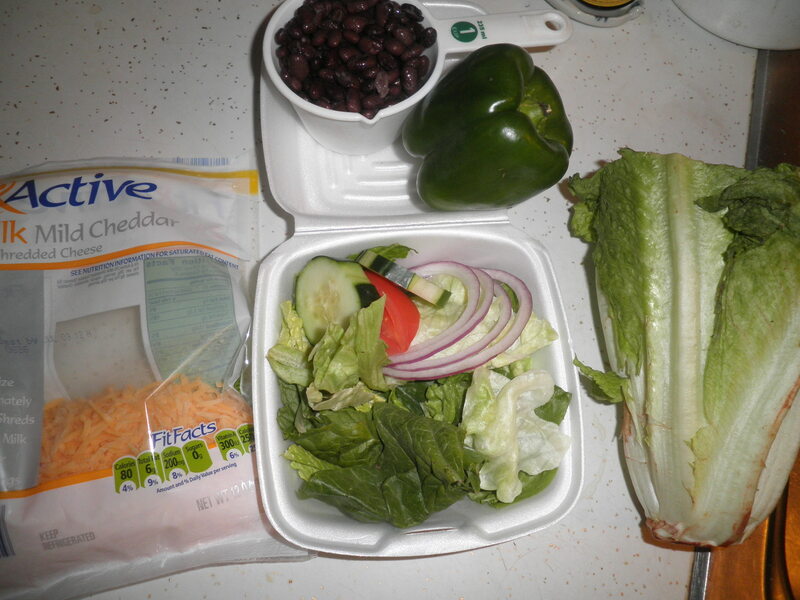 It’s What I Ate Wednesday~Love Your Veggies and now I actually have some veggies! WIAW is that wonderful thrill ride of food and fun which is the brain child of Jenn over at Peas & Crayons! When you’re finished reading here, please hurry over there to catch up on all of the great doings and be sure to leave some comments …we all love comments! 😉 So here we go! It’s hard to explain how lost I felt when I didn’t have my usual stock of veggies in the fridge. They are my anchor and my support when it comes to food. 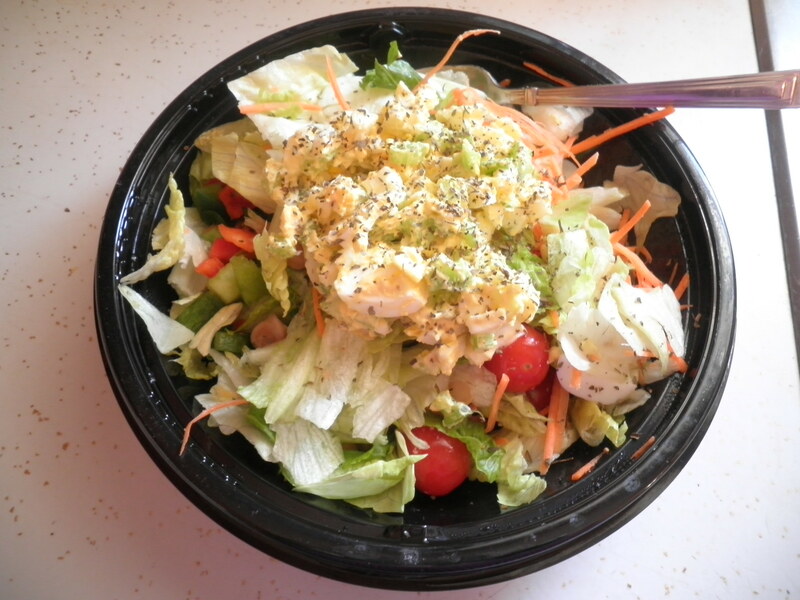 Veggies are what keep me going in following Weight Watchers. When I don’t have them, I stand there sight seeing in the fridge and freezer trying to come up with something to have for my meals! A trip to the produce market helped me to feel a much more secure. I purchased plum tomatoes (the best! 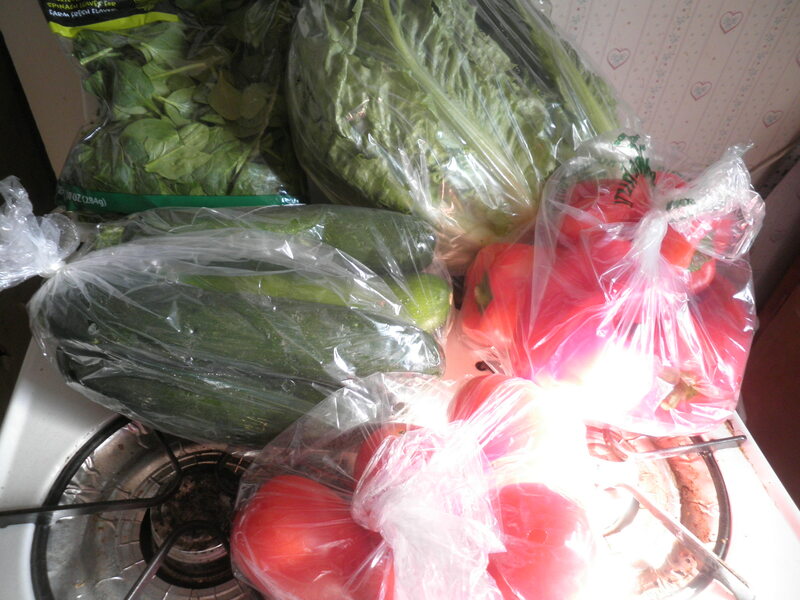 ), red bell peppers, zucchini, Romaine lettuce and baby spinach. I tried not to get carried away because my fridge space is limited and it get’s frustrating trying to find places for all of it. This all fit nicely! 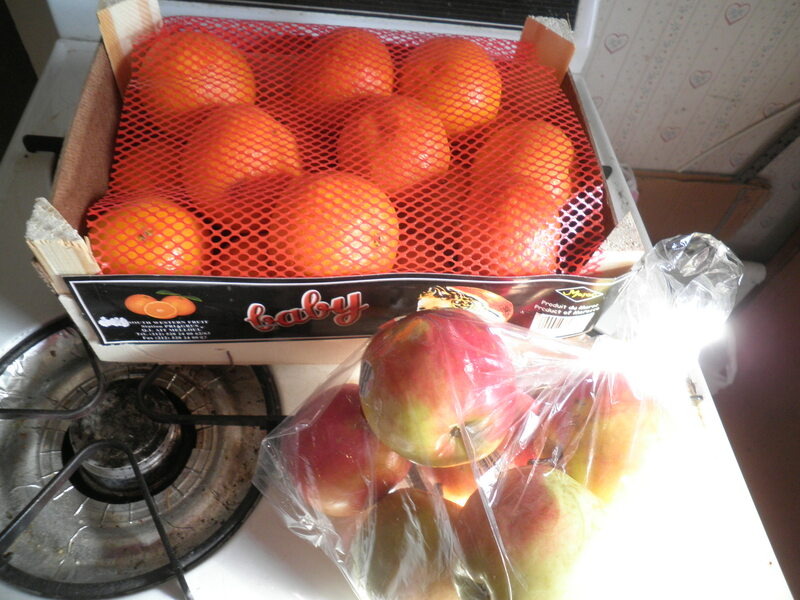 I also grabbed some pink lady apples and come clementines which were only $5 for the crate. Better price than I’ve seen in a while. So excited! Now I feel calm and in control. I made myself a delicious little lunch plate. 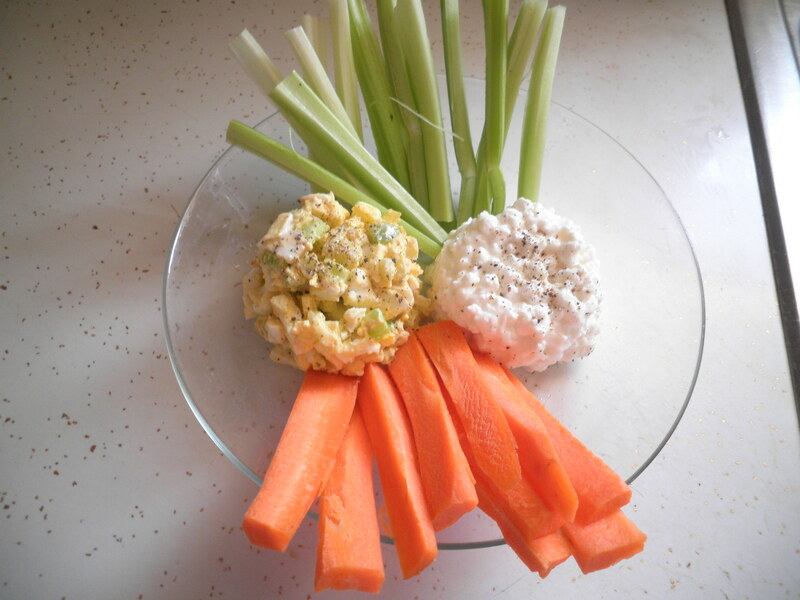 I remembered that I had cottage cheese in the fridge so a half cup of that accompanied by a half cup of the egg salad I made on Monday was perfect with some carrots and celery which I’d pre chopped also on Monday. 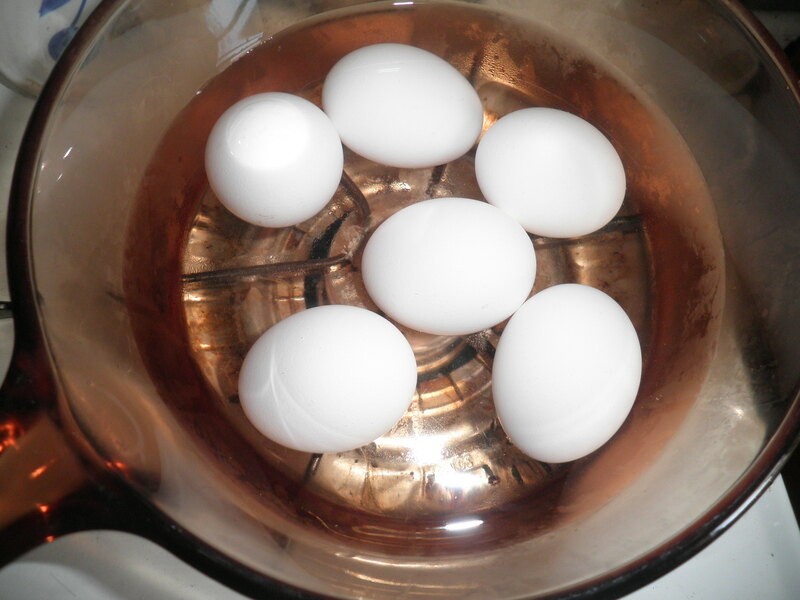 Having the egg salad ready is a great idea for lunches. Having the veggies prepped and in the fridge is a long standing WW trick to help avoid snacking issues. I need to do it more often and I plan to from now on. 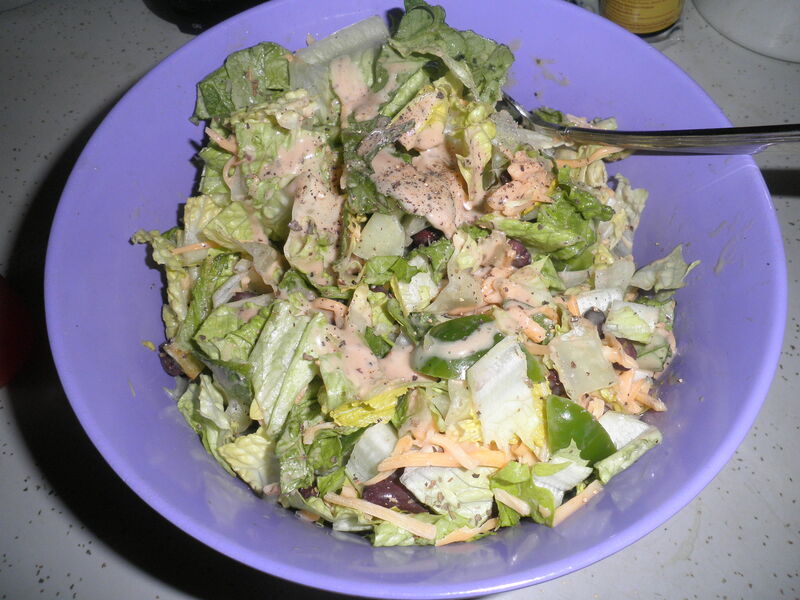 For dinner, I couldn’t resist one of my Big Purple Bowl salads! I’m never sure which looks better. Either way it tasted great! 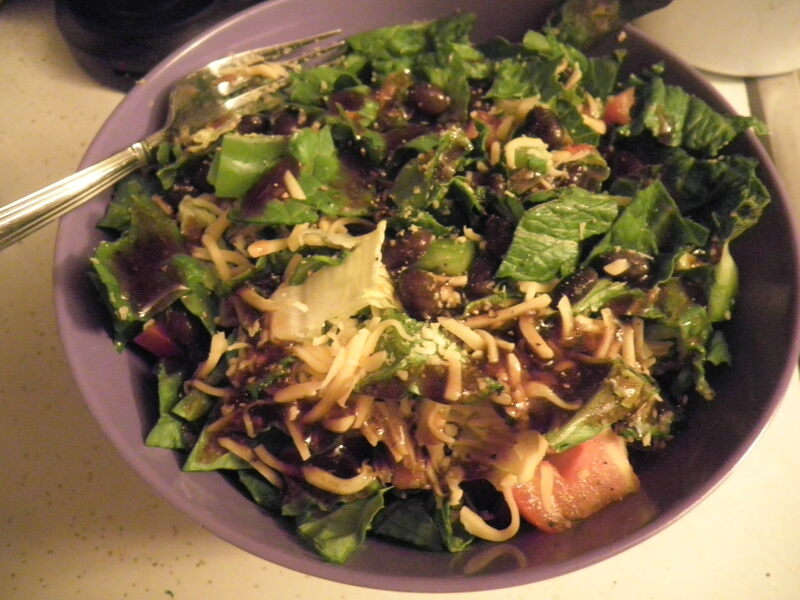 Romaine, green bell peppers, celery, plum tomato, crock pot black beans ( yes, I’m Still working on them!) 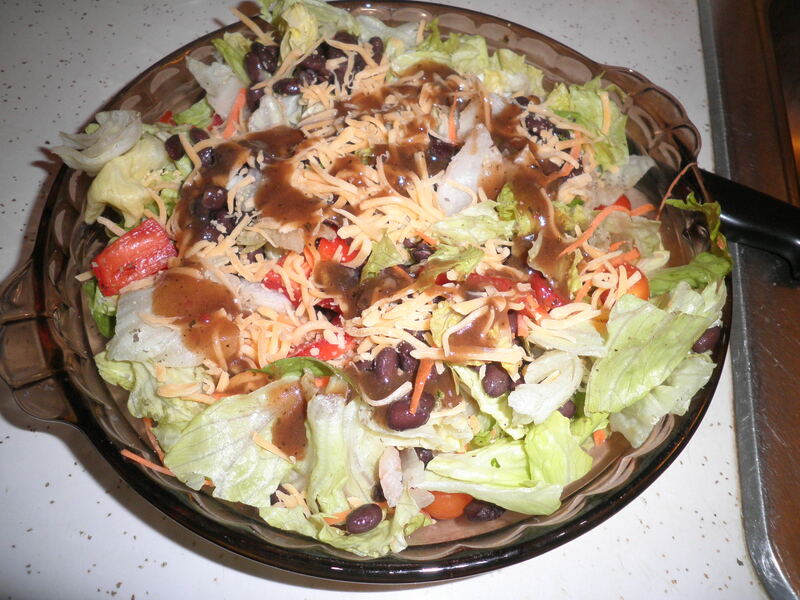 shredded cheese and balsamic vinaigrette. Very tasty and so filling I didn’t have Any snacks after dinner. I kept thinking that I had clementines and apples, but just never really felt like I needed them. So that’s it for me for WIAW. I feel so much better now that I’m re-stocked. It’s always a good idea to have the things on hand that keep you on track. That’s the way to be successful! Don’t forget to rush over to Peas & Crayons now to check out all of the fun. We all love it when you visit! May I Have The Envelope, Please! Sunday was a day spent working at getting out of a funk. 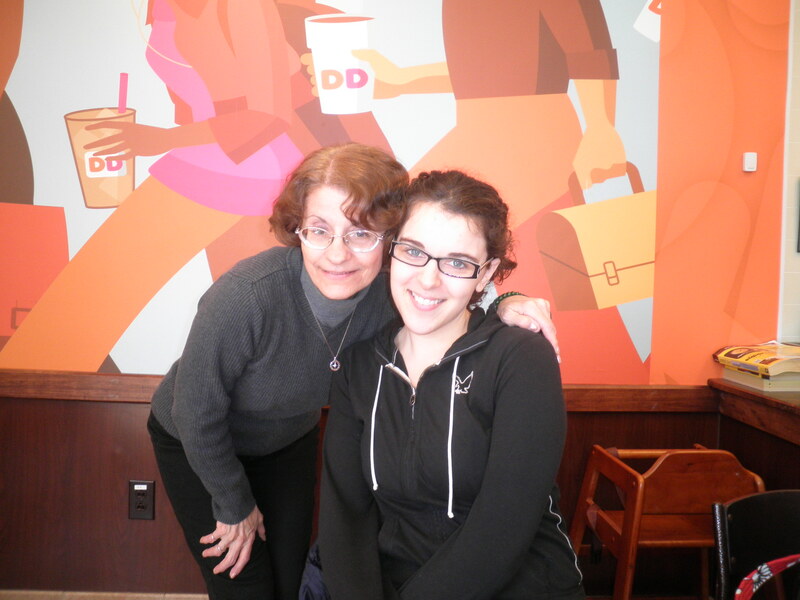 Started the morning by meeting for coffee with my sister, Ele and my friend, Kristen. 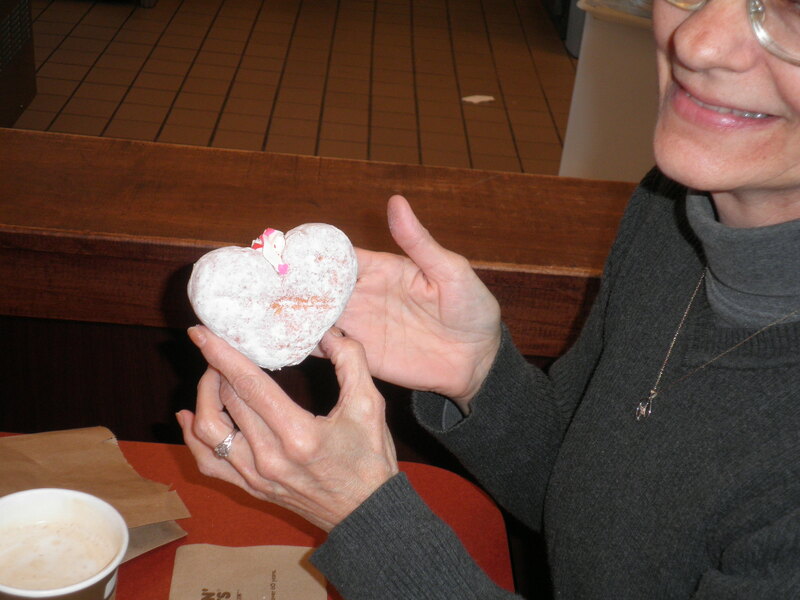 Our favorite spot for this is Dunkin’ Donuts. I was very good. 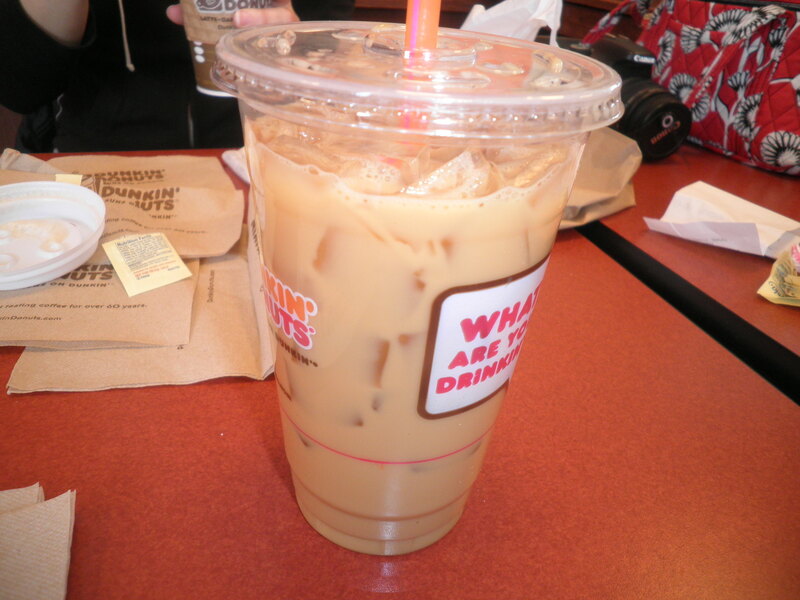 I don’t know why but even though it was pretty chilly…I wanted iced coffee. 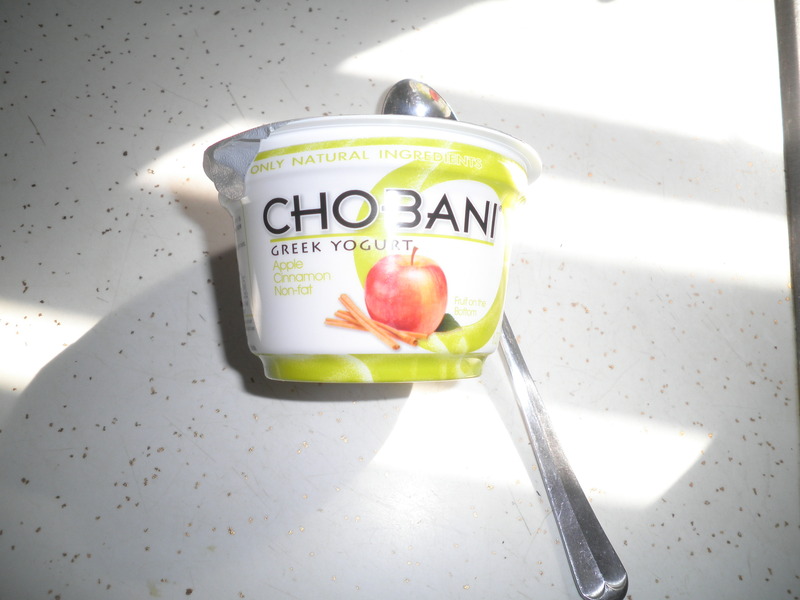 With a shot of sugar-free cinnamon syrup, it was very tasty. We chatted for a good long time. We love going to DD because no one tries to shoo us out, we can sit as long as we like. It was so nice to have a chance to get together again! I started it last night and I’m already caught up in the continuing story. I didn’t read as much as I would have like because I was, of course attending the Oscars. I’m going to work on devouring it today! WaWa lets you build your own sandwich. 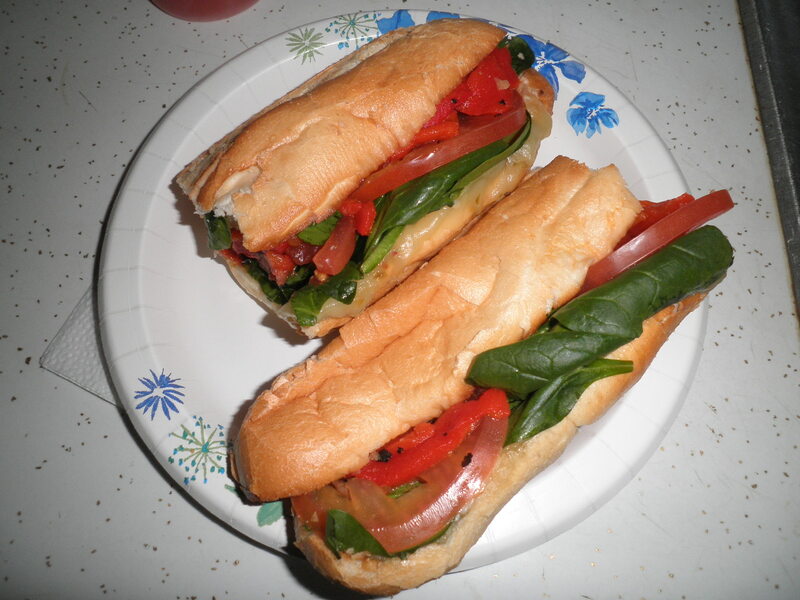 I had pepper jack cheese melted on the bun, then spinach, tomato and roasted red pepper added. It was delicious. It was also very filling which helped me with my recent issues with grazing in the evenings. During one of my visits with George in New York, he introduced me to J. Roy Helland. Roy is an amazing makeup artist. Back then one of the people he worked with was a rising young actress named Meryl Streep. In the years following, being a fan of Meryl Streep and the kind of person who watches All of the credits in a movie, I would notice Roy’s name always appearing in her movies. It was so exciting to see him win for Best Makeup for “The Iron Lady.” It was additionally exciting to hear Meryl Streep thank him in her acceptance speech and talk about their long collaboration. It is all the more touching to me because my friend, George passed away about 14 years ago and tomorrow is his birthday. I know he would be very proud of his old friend, Roy. I feel ashamed and there is no photographic proof to this, but I feel compelled to be truthful. I ate half a pizza yesterday. 😦 I’m not proud of it, but it was something I needed to get out of my system. I haven’t had pizza in a very long time. However, I did not need to eat it all. 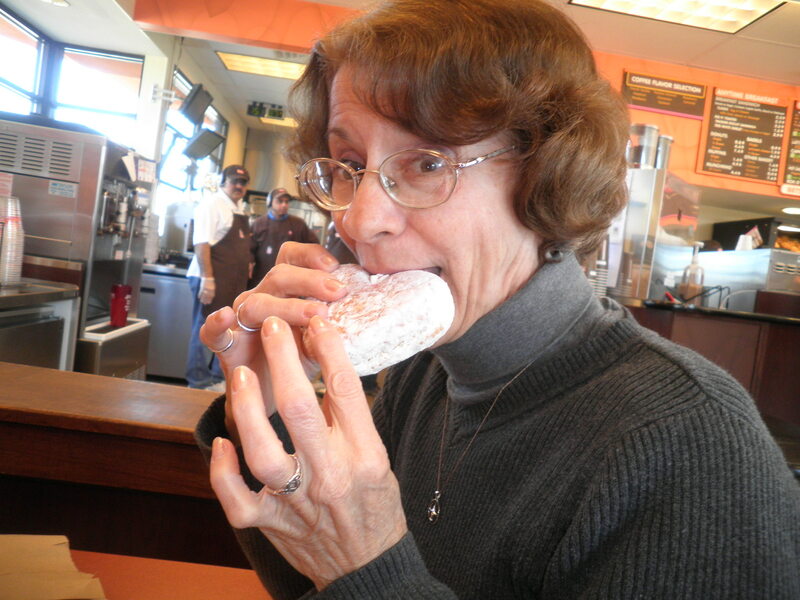 My theory has always been, It’s there…I’m going to eat it eventually…If I eat it now, I can start working it off now. That’s my theory. Is it based in fact? I don’t know. Prolonging its’ presence doesn’t make me a better person. I can start with a New Day and a New Attitude. I am choosing to look at the positive. Today should be a very good. I have plans to go for coffee with my sister, Ele and my friend, Kristen. We haven’t had a chance to sit and really chat for a while so I’m looking forward to that. Yes, It’s the Oscars! Live From Los Angeles! Gee I sound like someone on E! News! I really do get excited for the Oscars each year. Give me some wine sometime and I’ll tell you about the best Oscar Night party ever. Not sure I could have another party mainly because I’m much crankier than I was back then and I’d probably be shushing everyone! No need for that here tonight. Ralph will probably only watch a little of it. He’s not as much a fan as I am. I’m really looking forward to it. Hopefully, these things will brighten my day and get me out of this funk. Sometimes the Bear eats you. That’s one of Ralph’s favorite sayings. Another is Shoot The Bear When It’s There. Not sure what his hang up is with bears, but…Anyway. I was very excited for us to have the chance to get together Friday night with several of my old friends from the hospital where I used to work. They are lovely ladies and I miss them terribly. 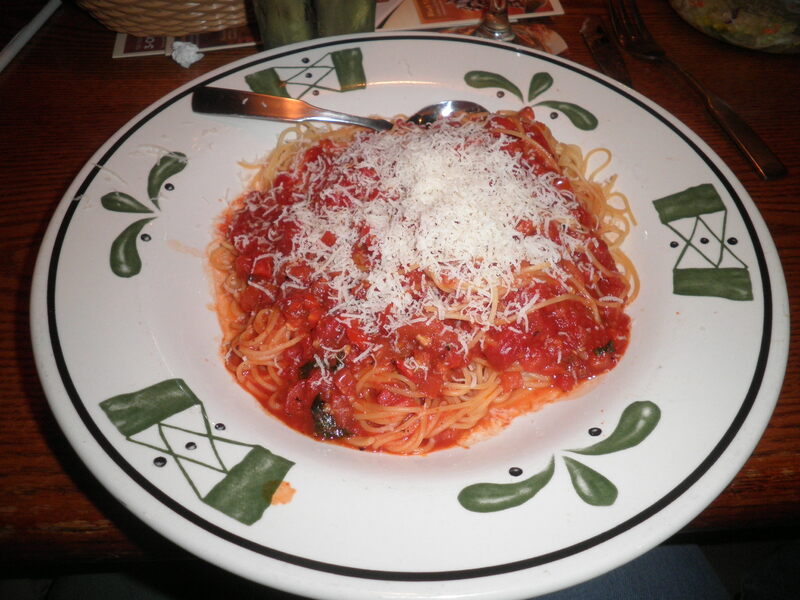 We decided to meet at a local Olive Garden. I was happy because I knew I could get something vegetarian and also that I could look up their menu on-line to determine the Points. I’d never done that before and it was painful to find out that their capellini pomodoro was 21 Points on Weight Watchers and the salad with dressing was 8 Points!! That’s my entire Points allowance for the day, and this on a week when I’ve also used most of my Weekly Points Allowance. Ah well. I forgot a photo of my salad but here is my pasta. 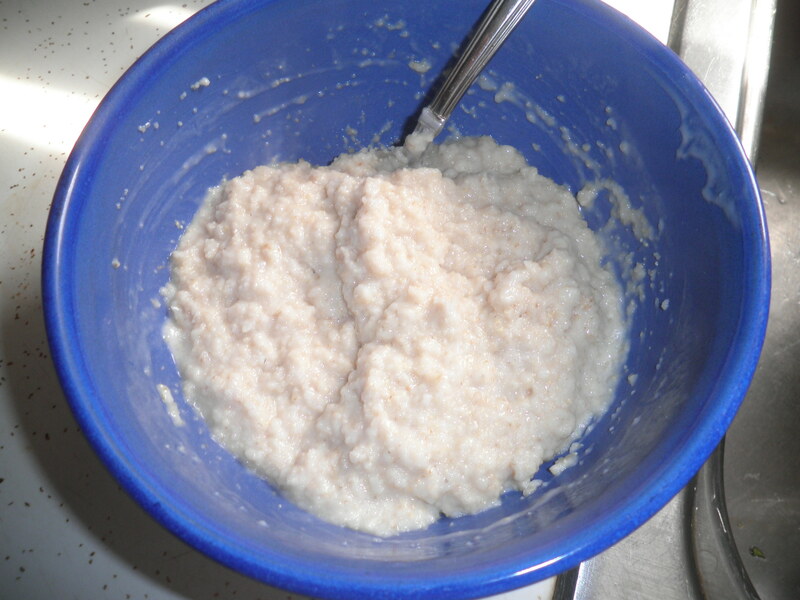 It was very tasty but I can make the same thing at home for a LOT fewer Points. 😦 The one good thing about the salad is that there was hardly any dressing on it and probably didn’t really count for 8 Points. But I have to be honest and count it that way. We were having such a great time talking and laughing that I never even took any photos of the group. There were desserts on the table, but not in front of me. All I had after my meal was coffee. I was not optimistic heading to WW this morning. When I got on the scale, I had gained 1 and 1/2 pounds. It was about what I had expected. I have to be very focused in the coming week to turn that around. I’m sure I can do it, I just need to have a plan. My friend at WW, Wendy shared a wonderful quote this morning. I like that so much. I need to formulate a plan for myself this week. I know I can do it. To sooth my Pain… 😉 …I made a stop at Goodwill on the way home. 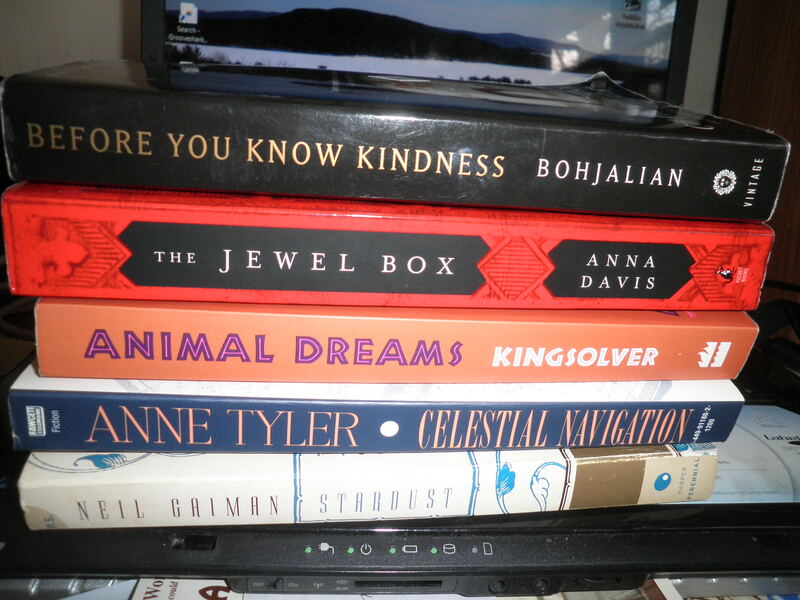 Five books for 49 cents each!! Excellent! And I completed my card that will give me 20% off of one purchase. I had to make 10 purchases. I’m going to save it or something big! I’m going through withdrawal. I going to be getting Mockingjay from my friend tomorrow and I can’t wait to start it! I don’t want to start anything else in the meantime, but I’m going through…Withdrawal!! Oh, and I have to prepare for the Oscars!! What shall I wear? What shall I prepare?!? Always such an exciting evening and Billy Crystal is back!! What could be better? Ralph and I decided we felt like getting out for lunch. We decided to go to In A Pickle. This is such a fun little restaurant. It’s small but they have quite a large menu. I usually go with a salad but I felt the need for something more substantial this time. I ordered the tomato and mozzarella panini. It came with a small bag of chips but of course, I passed on them and Ralph got to enjoy them. As always, we stocked up on the bread and butter pickles from the pickle bar. It’s so great that you can go up, choose your pickles and get refills if you’re interested. 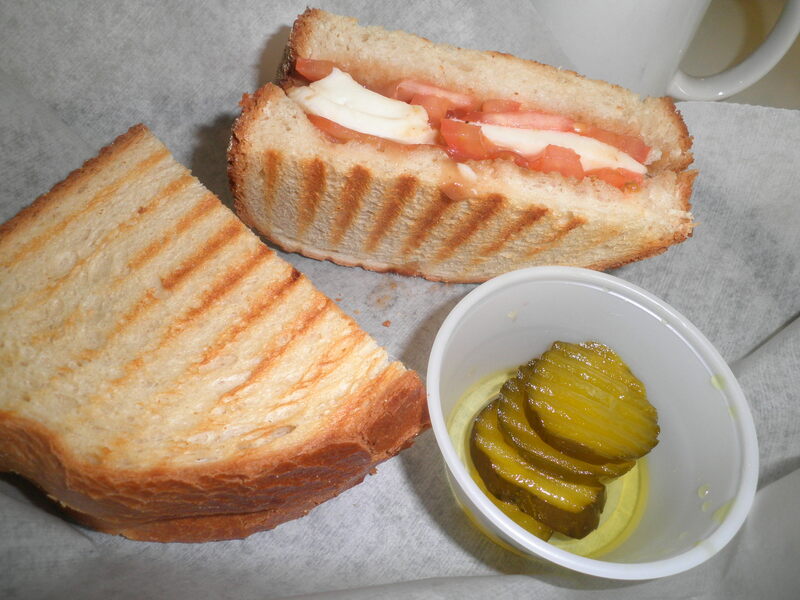 I’ve had this panini before and it’s very good. I’m always amazed and pleased by the fact that it is not in the least bit greasy. It’s really tasty too. As always, Ralph did some art work for the ladies who work there. 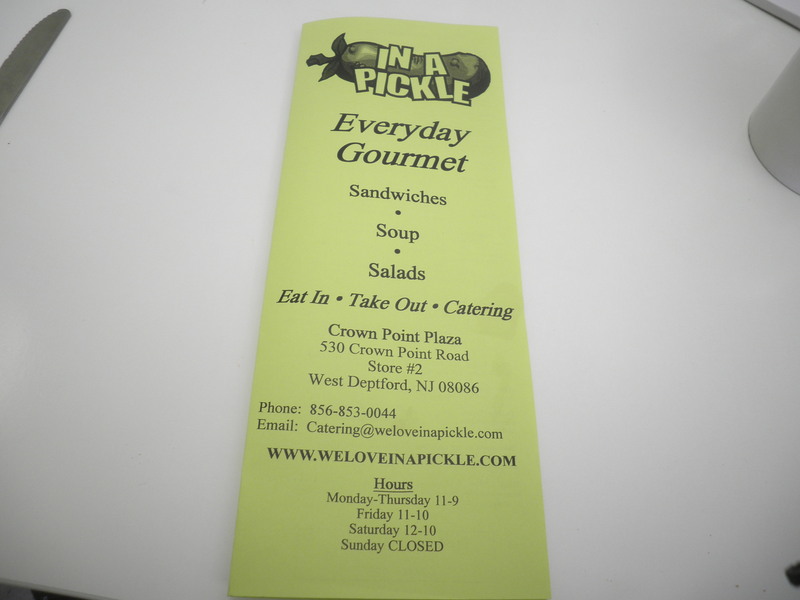 The art work is always “pickle” themed and they have them all hanging on their bulletin board. 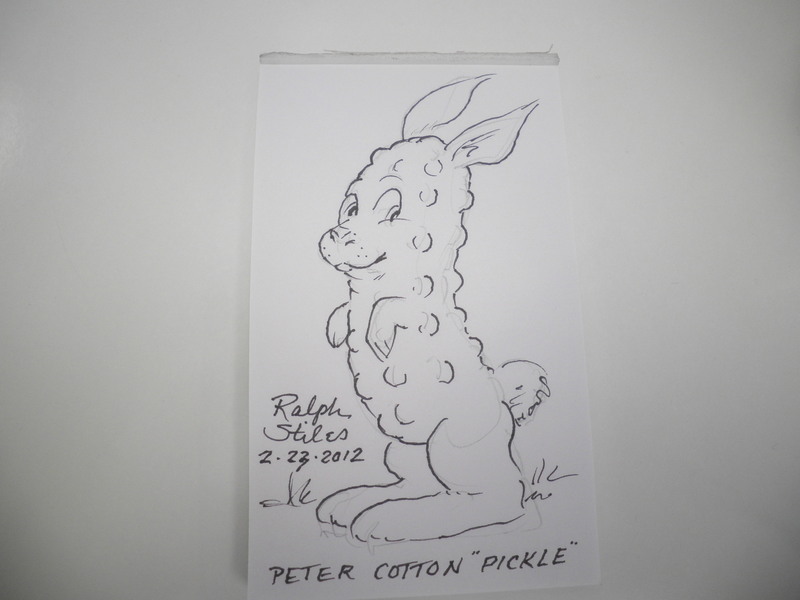 Yes…that says Peter Cotton Pickle. I take no responsibility for his crazy sense of humor! Lucky for me, dinner was partially made for me. 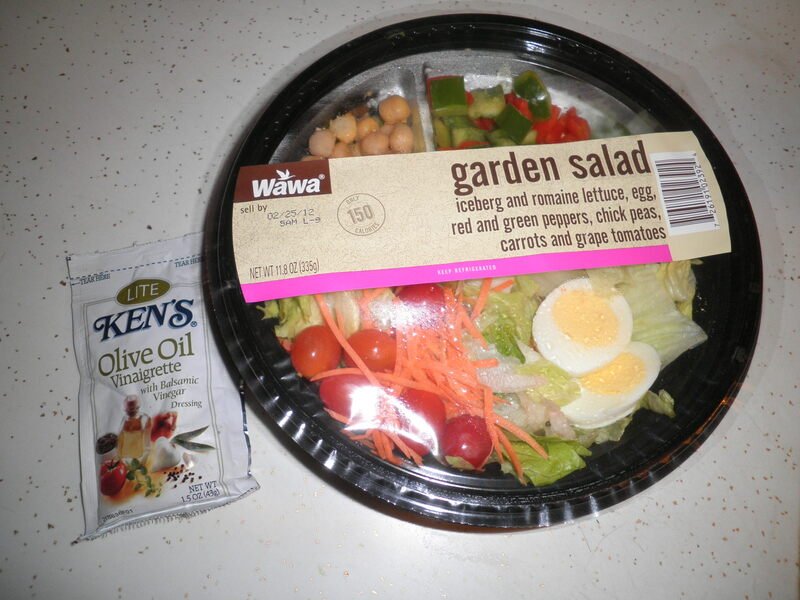 Ralph had stopped at WaWa and picked up a garden salad for me. 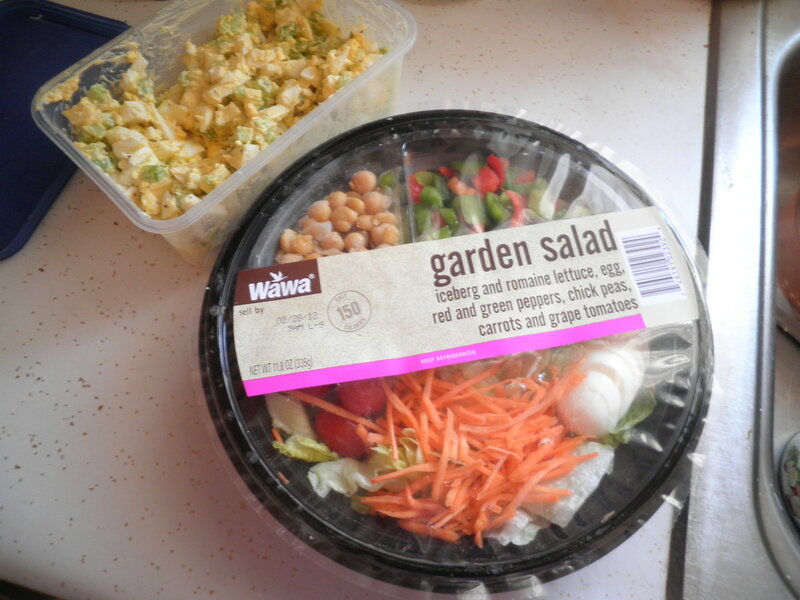 These salads are really pretty good. They even have the chick peas and egg to add some protein! 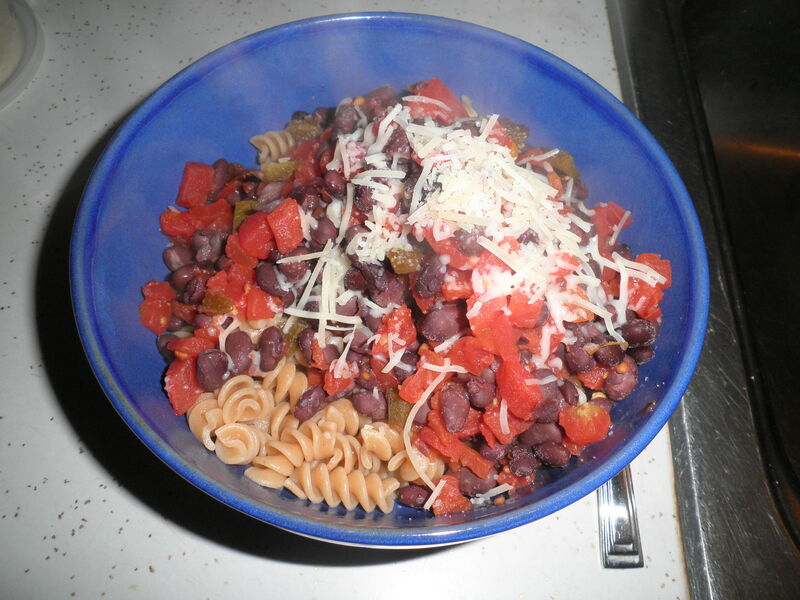 I added a red bell pepper, home-made black beans and shredded 2% cheese to the mix. I really need a trip to the produce market, because I would have added more, but that’s all I had! It was great though and quick because it was half way made! Today’s agenda includes dinner with some of the wonderful ladies I used to work with. We’ll be going to Olive Garden and I need to go on-line to look up the directions and the Points values of some of their entrees. Heaven only knows what kind of effect this will have on tomorrow’s weigh in. I’ll do my best! One of the things about writing a healthy living blog is that you examine your food more and think about it more than a normal..uh…Regular person does. Thinking about it, examining it, planning it. It all happens much more than I might have thought. The other day when Ralph and I went to lunch, I ordered an omelette for lunch not realizing that if it came from the lunch menu, it would come with extras. It came with a side salad and I really was in the omelette mood rather than the salad mood at the time. I asked the young lady to wrap it for me to take home. She did. I didn’t however, eat the dessert that came with it…a certain little cowboy did…Sherriff Ralph to the rescue. Not big, but a good starting point. A few additions from the fridge. 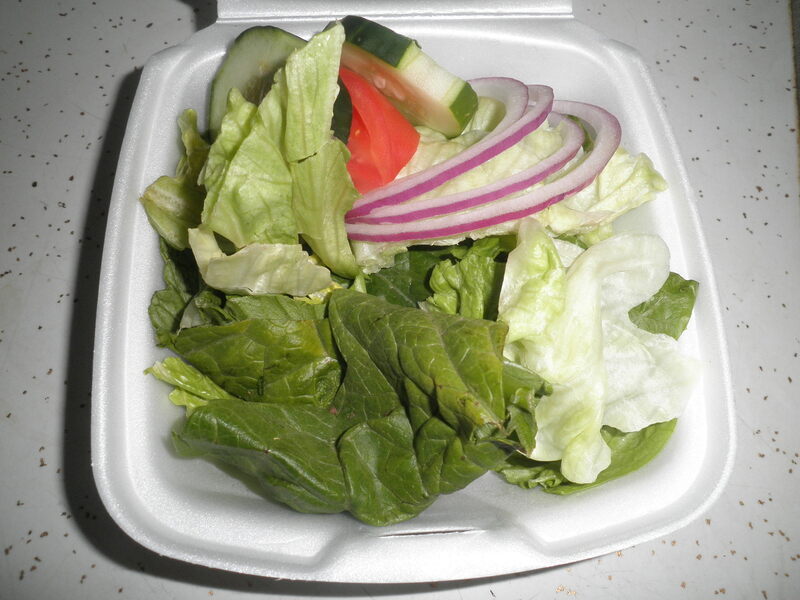 The very last of my Romaine…gotta get to the produce market! 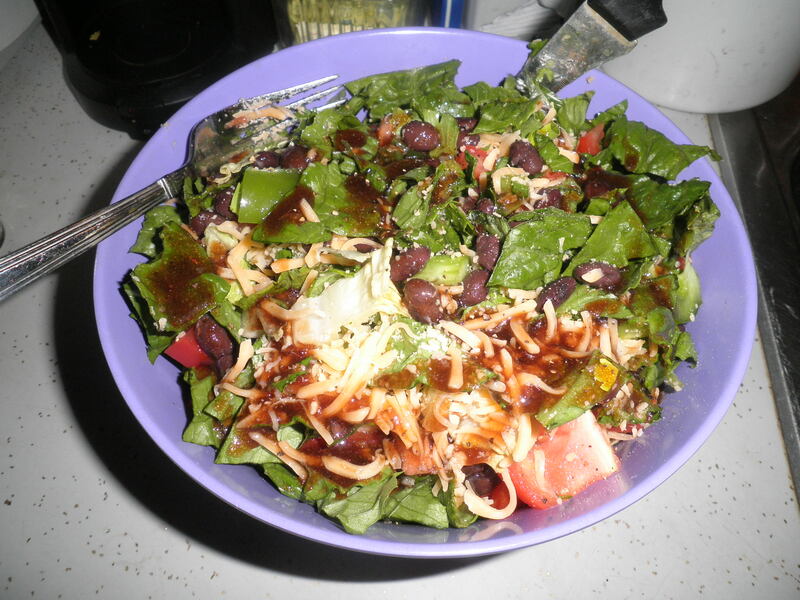 Home made black beans, green bell pepper and shredded cheese. 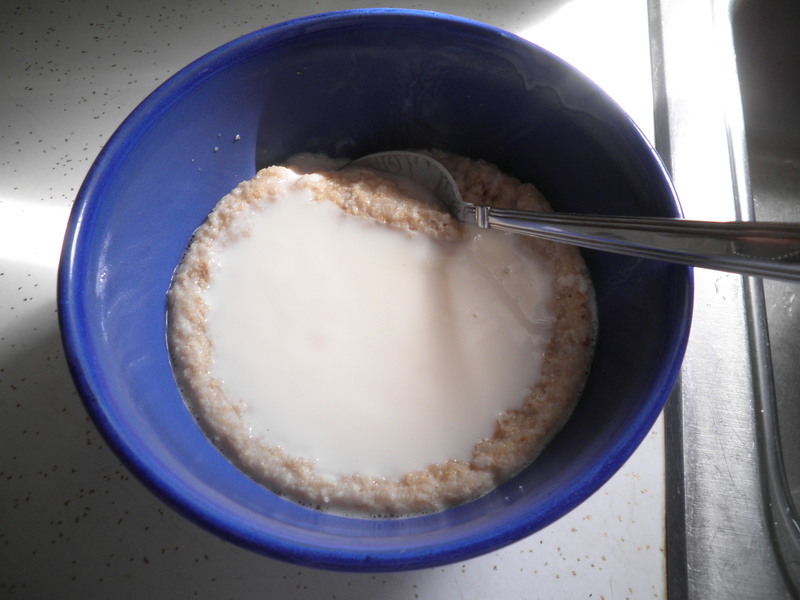 I decided to add some fat-free vanilla yogurt in place of the almond milk. All day Wednesday I had a nagging headache. 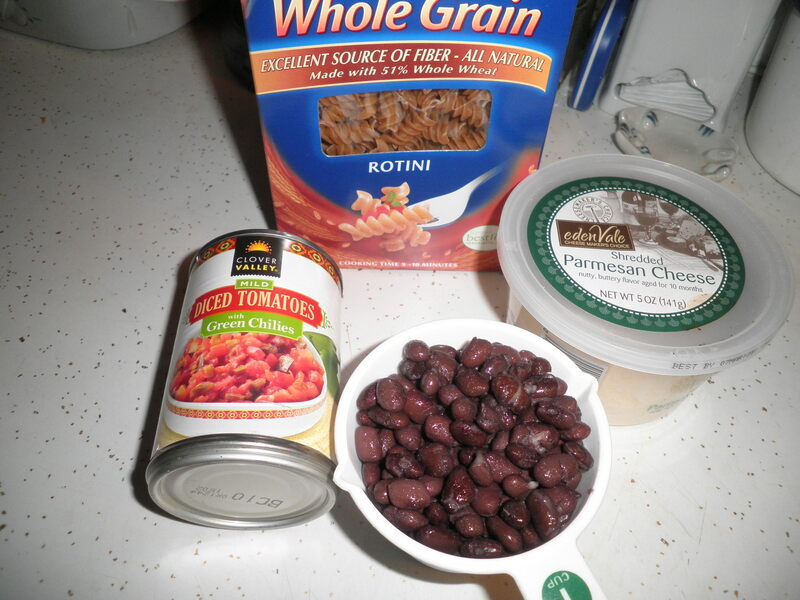 Ralph was set for dinner with leftover crock pot roast, so I needed to find something that would be simple, but filling because I felt that otherwise it would be a grazing night…constantly looking for something to snack on. Hoping for the day to improve as I go along. Hope your’s is terrific!